CITYBLOCK by Christopher Franceschelli is a chunky book with thick pages that is perfect for little hands. You follow two little kids as they explore a big city from the museums to elevators to gift shops. The block style book is very neat to behold. Some pages fold out while others offer a peek-a-boo to the next page. It really captures the feel of a big city on the pages. Cityblock explores city life in an exciting and unique way, from up in a high-rise building to down in the subway. Divided into three sections—things that go, things to see, and things to eat—it features 24 different aspects of city living. As with the other acclaimed books in the series, die-cut icons hint at the larger context on the next spread. Each section opens with a full city scene but gradually focuses in on the small, unique neighborhoods that make the city large and grand. This clever book will attract young readers living in a metropolis as well as those in the countryside with urban life that pops off each page. 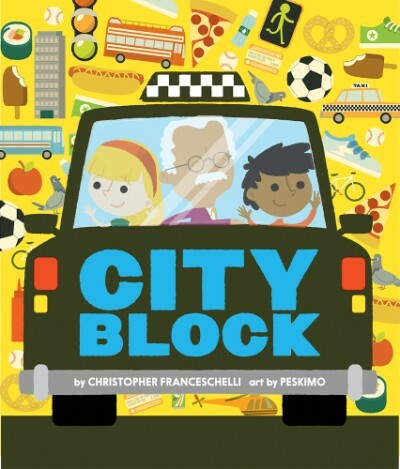 You can get your copy of CITYBLOCK at your local book retailer or online at stores like Amazon.